In my mind, Mona di Orio has always been associated with quirky — and sometimes outright challenging — fragrances. Mona di Orio Nuit Noire is as dark and animalic a fragrance as I’ve ever smelled. Even the perfume house’s single note fragrances such as Vanille and Cuir focus on those materials’ less obvious aspects. With Dõjima and Suède de Suède, the house made a conscious decision to satisfy “the demand for more accessible fragrances for those who recently discovered niche” by developing “more accessible fragrances to build a bridge to the more complex creations in our collection.” Lucky for us, both fragrances are still likely to be plenty interesting to experienced perfume lovers. Perfumer Fredrik Dalman developed both Suède de Suède and Dõjima. Suède de Suède’s notes include woody suède accord, cloudberry, osmanthus, Sichuan pepper, cedarwood, patchouli, musk, strawberry leaf and castoreum. Suède de Suède is a rich, creamy, “straight” suede with a fine-grained texture — sort of the suede mousse of leather fragrances. This mousse is woody and slightly tangy with cedar, and it sweetens as the fragrance wears on skin. Osmanthus adds a hint of leathery apricot, but Suède de Suède doesn’t feel floral as, say, Lancôme Cuir de Lancôme. Nor is Suède de Suède salty or oily. It’s a tightly focused, creamy suede with enough softness and sweetness to comfort and enough tartness and edge to avoid being cloying. Suède de Suède has good sillage and lasts about four hours on my skin — not as long as I’d think, given the fragrance’s initial presence. If you love sueded leather, you’ll probably want to smell it, but if you’re satisfied with your bottles of Serge Lutens Daim Blond and Cuir de Lancôme, you might not need to rush to order a sample. If both of those fragrances feel too offbeat to you, Suède de Suède could be the answer. Dõjima is my favorite of the pair. Its notes include rice powder, jasmine, oris, amber, dry spices, Sichuan pepper, musk, nutmeg, ambrette, clary sage, labdanum and sandalwood. The fragrace is named after the Dōjima Rice Exchange founded by Samurai in 1697 in Osaka, Japan. In the PR materials, a lot is made of Dõjima’s powder (“cloud of rice powder” and “turns to powder”), but don’t think Dõjima smells like baby powder. It’s no dressing table fragrance. 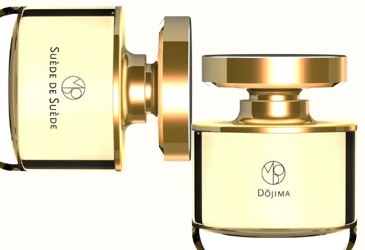 In fact, Dõjima’s initial soft, rich texture makes it Suède de Suède’s sister, in my mind, except that Dõjima smells more like dried grain and grasses through which someone wearing a floral-spicy perfume has walked. The rice — not cooked rice, but the dry, nutty grains — is what the fragrance is all about. Dõjima doesn’t smell “perfumey” to me, but, again like Suède de Suède, comforting. Where Dõjima really diverges is in its dry down. Unlike Suède de Suède, it doesn’t sweeten, but turns spicier. Instead of hunkering down to a tight, velvety sillage, it lightens and diffuses, and a touch of earthy jasmine shimmers above it. Dõjima lasts about six hours on me and stays close to skin. It’s easy and unobtrusive to wear, but not an “obvious” (read mass-produced-smelling) scent. Mona di Orio Dõjima and Suède de Suède Eaux de Parfum are $200 for 75 ml. For information on where to purchase them, see Mona di Orio under Perfume Houses. Ouch, that price isn’t ‘accessible’ though. Shame, they sound good. Pricing on perfume must be tricky. On one hand, if they price too low, they may feel they risk appearing unimportant or not luxurious. On the other hand, $200 is a lot for a bottle of fragrance. They’re not giving it away, that’s for sure! The new bottles are 75 ml and more expensive than the older 100 ml. No logic, just profit-profit-profit. Fragrance prices seem to be edging up everywhere. I’m getting so choosy about buying perfume these days. These sound attractive, Angela. I like Daim Blond very much, but I wouldn’t mind something a bit softer, too. Cuir de Lancome is too powdery for me. I haven’t focused on this line, but I do like Vanille. Suede de Suede is a bit sweeter than Daim Blond, too. There are so many good leathers out there! Nice reviews! I will try these the next time I’m at Osswald. Hajusuuri, have you tried Ramón Béjar Sanctum? It’s an incense fragrance that EauMG is recommending for summer. In the US, it’s only available at Osswald so far. Oooh, I don’t recall if I have. I was there last month and Josie showed me a bunch of stuff but the one I liked the best was Amouage Bracken Woman. I will add this to the list to sniff! Thanks, looking forward to your reactions! Currently my favourite leather/suede is Bottega Veneta, which is half the price of the Mona. I’ll give them a sniff anyway though, as the rice one sounds interesting. Yes, Bottega Veneta is hard to beat at that price, and it’s a terrific fragrance. Looking forward to smelling these. Suede probably sounds more appealing but you never know until you try. Dojima sounds interesting, since I’m pretty covered on the suede front and your description is really appealing. At that price, though, it”d only be a decant…. Dojima is the one that draws me in the most, too. That said, a perfume has to really knock me out to find a place in my crowded perfume cabinet these days–and to get me to spend from my already tight budget. Funny. I translated Suede de Suede as Swedish Suede. But at that priceoint I’d rather cook something up myself. And call it Vellum Musk. And obviously Dalman is a Swedish perfumer. Doh! Maybe you’re right about the translation! I hadn’t even thought of it. I haven’t been this excited about a release in a long – and I do mean long – time. Mona di Orio is one of my two favourite niche houses, I frequently wear and adore seven of her collection and also appreciate the rest, although the price is horrendous in my opinion as well . Rice and rice powder is a note I almost always fall for, though now I know better than to expect KenzoAmour, Love, Chloe or Teint de Neige here, well obviously I cannot wait to get my sample. Thank You for this lovely review, seeing Your name under this particular review really made my day. I’m glad you enjoyed the review! You’re right not to expect something dressing-room-powdery here. In fact, although I definitely thought of rice when I smelled it, the powder aspect didn’t jump out at me. I hope you enjoy your samples!